London, UK, March 2016 – Freedom for parents with young children often comes in the form of going outside for a quick stroll in the park or a day trip in the car. Britax followed parents to the beautiful outdoors to draw inspiration for its new collection of car seat, pushchair and bike seat colours and fabrics. From Lagoon Green to Mineral Purple, the “Inspired by Nature” collection evokes fresh images of royal blue ponds and bright red poppy fields. The ten new colours are a perfect match for any lifestyle – from the avid hiker who spends significant time outdoors to the city mum who walks busy streets with a stylish pushchair to match. The “Inspired by Nature” collection features bold and vibrant styles as well as smooth and soft shades representing the different elements of nature. Up-and-coming automotive trends were integrated into the design process to ensure that the colours are not only a perfect match for different types of families, but also for new cars coming onto the market. New designs Cosmos Black, Ocean Blue, Flame Red, Mineral Purple, Sand Beige, Steel Grey and Wood Brown are available for various products in the car seat and pushchair lines for parents that want matching children’s products. Pushchair colours such as Lagoon Green pop out against any backdrop, making it fun to run even the most ordinary errands with children. 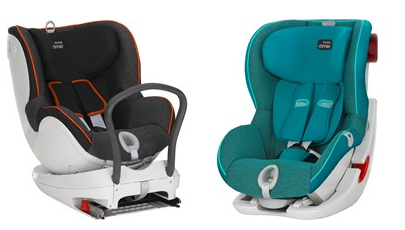 The new line for Britax Römer car seats is differentiated by the “tone in tone” technique – two base materials in two shades of one colour that add vibrancy to the car seat and highlight the comfort parts of the seat such as the shoulder pads or the headrest. A base fabric for the cover offers resilience for everyday use, while a soft fabric increases snugness in children’s comfort zones, such as on the head pad, shoulder pads, belly pad and SecureGuard pad. Two new ‘marble’ fabrics unite colours from the outdoors with chic automotive styles reminiscent of 1960s vintage cars. Black Marble and Green Marble are distinguished by the woven melange fabric, extra stitching, piping and unique finishing. They are available for select Britax Römer car seats. Iconic Britax Römer bike seats also received a makeover with three brand new designs: turquoise / purple, black / grey and red / blue. Each cover features a different colour on each side, providing parents with the flexibility to change styles as they wish. Cleaner fabrics means better fabrics: Our most precious cargo, our children, have sensitive skin and are still developing their immune systems and are adjusting to the world around them. Britax believes the best protection for children on the move are quality products made with care. The materials of its car seat fabrics from the new collection go beyond legal standards when it comes to many harmful chemicals in their products. In 2015, all Britax Römer car seats tested by German consumer organisation Stiftung Warentest received a Very Good score in chemicals. Additionally, Britax works with independent institutions to continuously test for and monitor the chemicals in their products manufactured all over the world. The colours are available immediately for all Britax products in the current range.